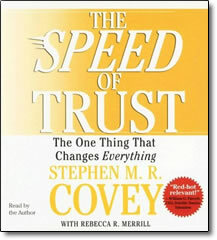 Speed of Trust – by Stephen M. R. Covey – Unabridged Audio – Discount! Covey reveals the 13 Behaviors common to high-trust leaders throughout the world and demonstrates actionable insights that will enable you to shift your behavior to increase trust in all your relationships. Like a ripple in the pond, The Speed of Trust begins with each of us personally, continues into our relationships, expands into our organizations, and ultimately encompasses our global society. Stephen M. R. Covey, oldest son of Dr. Stephen R. Covey, guides us on a revolutionary new path towards productivity and satisfaction. Trust, he says, is the very basis of the new global economy, and he shows how trust—and the speed at which it is established with clients, employees and constituents—is the essential ingredient for any high–performance, successful organization. For business leaders and public figures in any arena, The Speed of Trust offers an unprecedented and eminently practical look at exactly how trust functions in our every transaction and relationship—from the most personal to the broadest, most indirect interaction—and how to establish trust immediately so that you and your organization can forgo the time-killing, bureaucratic check-and-balance processes so often deployed in lieu of actual trust.